5.1.1 The Government of India has evolved a policy to overcome the problem of poor mobility which dampens the economic growth and deterioration in the quality of life. The approach is to deal with this rapidly growing problem as also it can offer a clear direction and a framework for future action. -- To allow our cities to evolve into an urban form that is best suited for the unique geography of their locations and is best placed to support the main social and economic activities that take place in the city. --Reducing pollution levels through changes in traveling practices, better enforcement, stricter norms, technological improvements, etc. i) The urban planners do consider the transportation as an important parameter, but the growth of the city has been so fast that the inadequacy sets in too fast to enable any possible review and taking remedial measure. ii) It is very much essential to carry out integrated land use transportation planning. However, as part of the study, the possible implications of the proposals on land use in some areas and recommendations for necessary changes in policy have been included. It is also proposed to test impact of densifying measures around MRTS stations. But such measures will require major policy change and practicability and implications of same will need to be studied. iii) Transport planning in the last two decades in BMA has been oriented towards developing a mix of public transport but funds have been a constraint. Despite same, a 36 km metro line has been taken up and the bus transport has been providing more and more services, which is indicated by the fleet growth and increased passenger trips. iv) Share of walk and cycle trips in Bangalore have been comparatively low in Bangalore even earlier. Non motorized trips share has been going down. Apart from non availability of cycle tracks on roads, increased trip lengths for almost all purposes may have caused this fall. v) The current policy has been more road oriented. The fast growing economy and higher per capita income has resulted in high vehicle ownership and usage. The roads in the core area getting congested and land cost mechanism has encouraged more of peripheral growth, increasing urban sprawl. This has resulted in longer trip lengths for all purposes. 5.3.1 With this background, it is desirable to have a vision be developed before considering different alternative strategies. A vision by definition is ‘a vivid image produced by the imagination’. A Transport Planner’s vision for the city and metropolitan area is to see ‘a well contained city with efficient people-friendly transport system with minimum travel time & maximum safety and comfort’. At the same time the facility provided should be optimally used. The different actions which have to contribute to this vision are diagrammatically represented in Figure 5.1. The diagram above paraphrases what we would like to see when we look at Bangalore ten years from now. In order to achieve this, an integrated land usetransport strategy is called for. Preparation of such a step is diagrammatically indicated in Figure 5.2 below. Considering the status of progress in various fronts that have already been initiated in Bangalore, the road to an integrated urban transportation strategy is fraught with difficulties. The process is bound to be messy and will appear costly in terms of time, money and effort to be invested in such an exercise. However, the COST OF NOT DOING THE INTEGRATION is far higher than that of doing it and the resultant situation, if the integration is not done, will be far more messy than the process of doing it. Therefore the following initiatives are recommended. 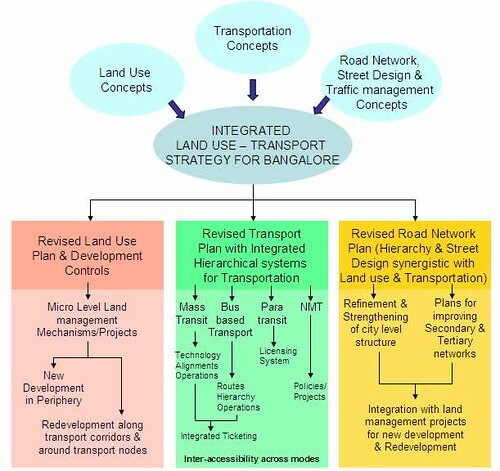 A team consisting of both urban planners and transportation planners and preferably led by an urban planner with a holistic understanding of urban transport issues should put together an integrated land use – transport strategy for Bangalore. This strategy should incorporate modern concepts in land use planning, urban transportation planning road network planning and street design in a mutually complementary manner. Such an approach necessarily means that the team should review the city’s Master Plan as well as plans relating to mass transport and road network improvements. A strategy such as this will have no statutory backing as such. Therefore if this strategy is to be taken seriously then it should be mandated by an overarching body which has sway over all the stakeholder organizations. No such body exists as of today. A Unified Metropolitan Transport Authority has been mooted on many occasions. Even such a body would leave out land use planning. Therefore the possibility of an Integrated Land and Transport Management Authority for Bangalore may be considered to mandate the preparation and operationalization of this strategy. The land use and density component of the above strategy can be operationalized only through revisions in the Master Plan. High traffic generating activities and high density (high FSI) zones should be realigned around mass transport nodes and along major transportation corridors. Such a reorganization of land use and density cannot be realized only through the modifications in the Master plan. In already developed areas, this needs to be translated into projects for planned redevelopment, ensuring that the high density and high intensity of activities are supported by appropriating land for improvements in the road network, street design and supporting infrastructure. The energy for redevelopment already exists in the real estate market in Bangalore, and will receive further impetus from the implementation of mass transport projects. In new growth areas, a mechanism for micro-level planning (such as Town Planning Schemes in Gujarat) will need to be introduced to ensure that all new development is adequately served by primary, tertiary and secondary road network with provision for public transport facilities. These would also essentially have to be translated into land management projects. Having articulated the approach to road network planning and street design in the Strategy document, the primary road network proposals in the Master Plan should be modified appropriately. In many places, particularly in the already developed areas, these modifications can be realized only through carefully structured redevelopment projects as the missing links in the primary road network will have to go through existing development. In the case of the secondary and tertiary level roads, as explained in the previous section, the improvements in developed areas, in many cases, will have to be achieved through planned redevelopment. In the new growth areas these have to be part of proactive land management initiatives. Street design has to be standardized according to the hierarchical level and function of a street and customized according to local conditions. On all BRTS roads, the street design of extremely high importance. In the areas surrounding a mass transport node also, street design has to enable easy access of pedestrians, bicyclists and para transit passengers to the mass transport facility. The important observations are as following, which will now guide the strategy for development. 1. The City though claimed to be compact in the basic premise, is actually quite wide spread - The development area of more then 800 sq km, to accommodate around 1 Crore persons by 2015/20 as per Master Plan 2015. Thus, a multi-modal system with a fairly large coverage will be required. 2. Pockets of economic activities like Hi-Tech & Electronic city having very large employment potential are planned. Of course a large part of the human resources to be engaged in these activities is expected to come from with in BMA but quite a large no. is also to the expected from the Bangalore Metropolitan Region & even from towns like Hosur, Tumkur, etc. This will require special High capacity mass transport system connecting these work centres with the living areas within Bangalore as well as meeting the needs of the long distance / suburban commuters, especially along the corridors leading to these centers. --Dispersal of traffic at the periphery by completing the PRR, & the other Ring Roads planned at the Regional level like the Intermediate Ring Road & Satellite Town Ring Road. 4. The master plan proposal of having Mutation Zones along practically all the radial corridors would require some sort of mass transport system along them. --Complete pedestrianisation of narrow commercial streets. --Providing adequate parking along the CRR and running dedicated BRT on the lower level of the CRR and restricting all private vehicles on the elevated portion thereof. --Smooth & free flow of emergency vehicles like Ambulance, Fire Engines etc in side the core area. --The goods feeder services like LCV be allowed to come in only doing 9PM to 9AM to unload materials etc. --Attempts may be made to decentralize certain trades requiring bulk carriage like heavy machinery, hardware, building material etc in organized markets beyond the ORR and preferably near the PRR. --On a few of the wide roads inside the core area the feasibility of running BRT etc. may be examined. Based on the above observations it is clear that the already planned network will be insufficient to cope up with the future requirements especially after the target year of 2015. As such in order to prepare the Comprehensive Transport Plan the following policy measures are required to be taken based on which the CTTP will be finalized. 1. Extension of mass transport system to provide wide coverage and interchange facilities with other modes of transport. 2. 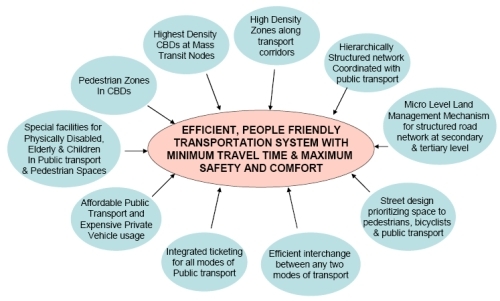 Provide substantially large network of medium level mass transport system such as BRT to cover the areas beyond the Metro network and on over loaded corridors. 3. Landuse adjustments and densification of corridors along mass transport corridors where possible. 4. Extension of commuter rail system upto the BMRDA’s New Townships & beyond upto Tumkur, Hosur etc. to act as sub-urban services. 6. Rationalisation of Local Bus system and its augmentation. 7. Improvement in traffic management through TSM measures. 8. Special facilities for pedestrians within the entire network specially in the core areas ; pedestrianisation of selected shopping streets in side the core area going to be served by Underground sections of Metro. Provision of pedestrian sky walks, under passes, footpaths and other road furniture along the roads where necessary. 9. Diverting through traffic on Peripheral Ring Road. Providing transport hubs at the junctions of Peripheral Ring Road with important radials such as; the National Highways and other heavily loaded roads. 10. Improving Primary, Arterial and other important roads by providing grade separation, junction improvements, adding missing links, widening and other road side facilities wherever necessary. The Arterial roads outside the PRR need to be improved upto the New BMRDA townships in order to take the increased load of commuters. 11. Transport integration of various modes.